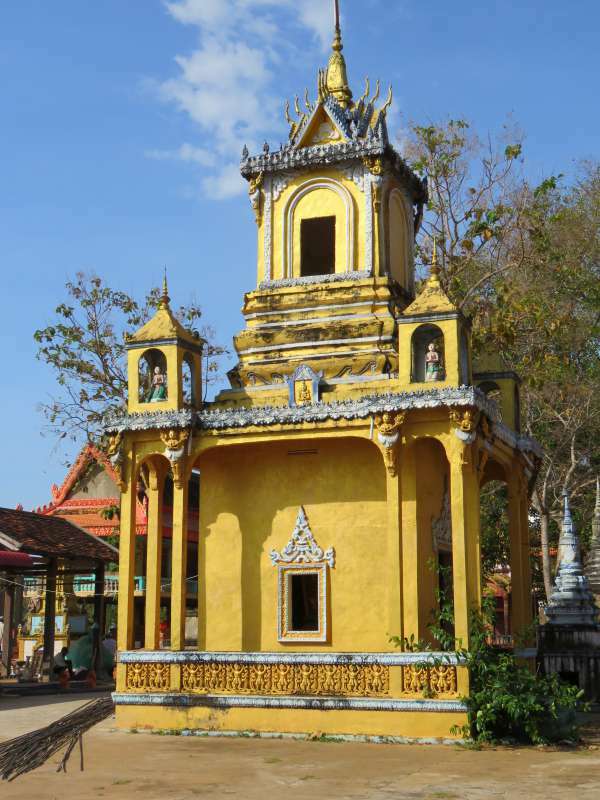 Like so many of the temples and pagodas we see along the Mekong River, Wat Hanchey looks as though it was freshly painted yesterday. The bright colours almost glisten in the morning light. One of the things which strike me in Cambodia is the contrast between new and old. Temples and pagodas look brand new, or they look ancient. They is very little in between. Our group coming up the path to Wat Hanchey. I didn't miss the path entirely. David and I walked down it on our way back to the ship. Wat Hanchey is populated by Buddhist monks and the many novices in their care. One young boy, about twelve years old, speaks to us about his life at the temple. He talks of rising early and eating only two meals a day. If he misses lunch he must wait until breakfast the next morning before he can fill his empty stomach. The temple strikes me as more orphanage than religious institution but the young novice is not an orphan. His family live in a village some distance away. 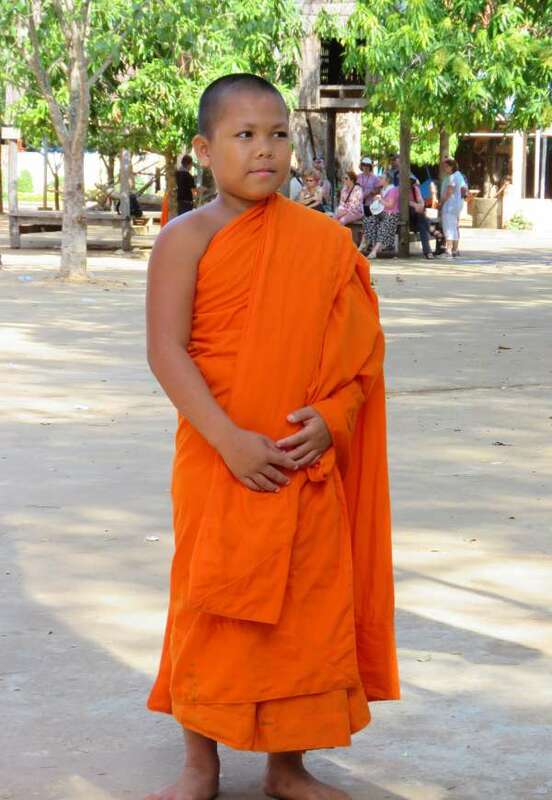 He tells us he volunteered to be a monk because he wants to learn - his favourite subject is mathematics. In a country still struggling to overcome the economic ruin of its brutal past this is his only path to education. I wonder whether a life of service to Buddha may not be too high a price to pay - easy for me coming from a country where education is taken for granted. Then he tells us he doesn't have to remain a monk. Once he is older he may choose to leave - in fact he thinks he might. We are treated to a demonstration of the intricate process of folding a Buddhist robe. 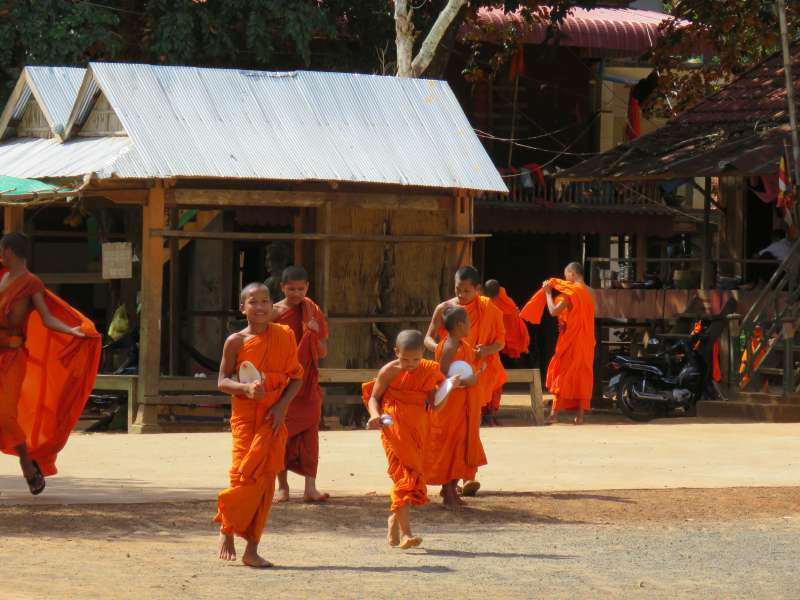 The orange cloth is worn in different ways for different activities throughout the day. I wonder how much time is consumed by folding and re-folding the troublesome garment. Before we leave we give him a small amount of money to thank him for his time. He says he will use the money for pencils, and then almost in afterthought, adds he will also buy himself a treat - something permitted to ward off the afternoon hunger pangs. He gives the impression that his life is one of strict rules and quiet contemplation - but there is something about him which makes me think the little boy inside sometimes escapes to play with his friends in the sunshine. Demonstrating the intricate process of folding a Buddhist robe. Some of the novices going in for lunch. Notice the two in the background refolding their robes into the lunch time style. 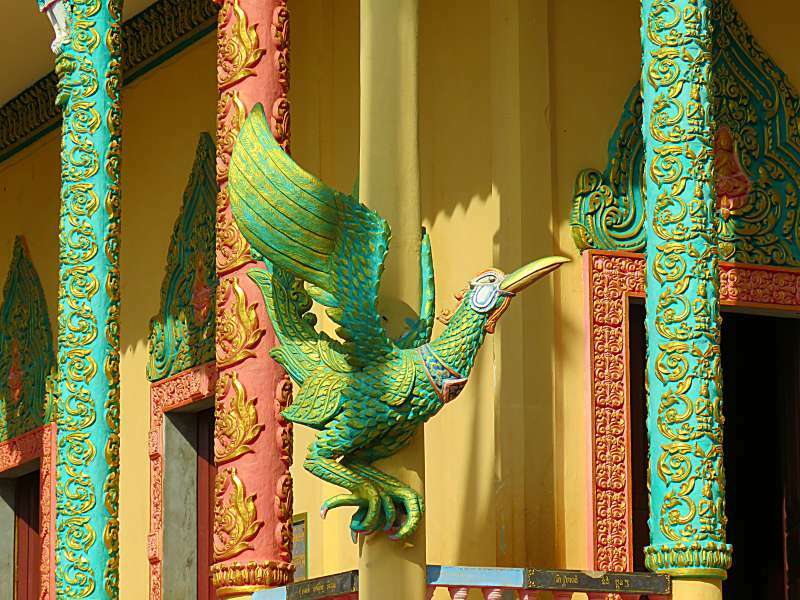 The buildings at Wat Hanchey are spread over a large level area overlooking a bend in the Mekong River. 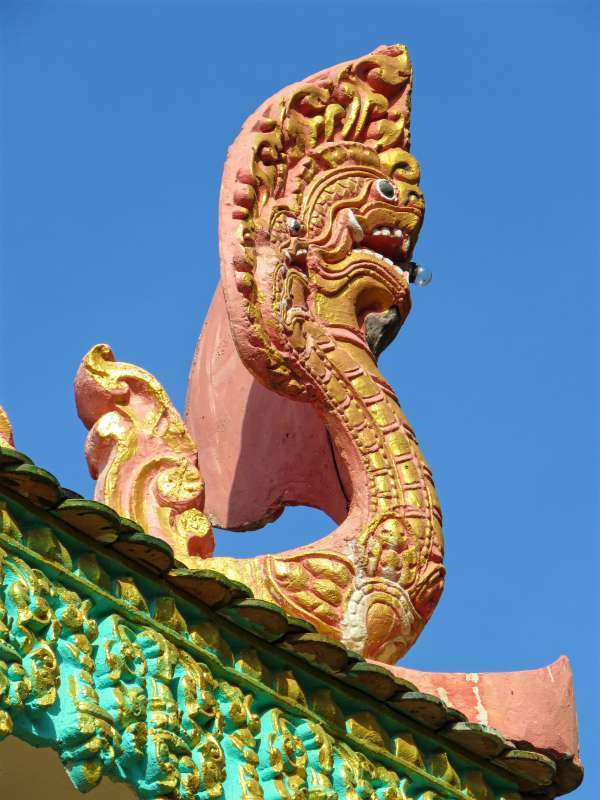 They consist of the main temple and many smaller structures, stupas, statutes and bizarrely, gigantic stone fruit. A stupa is a building which contains religious relics or the ashes of monks. 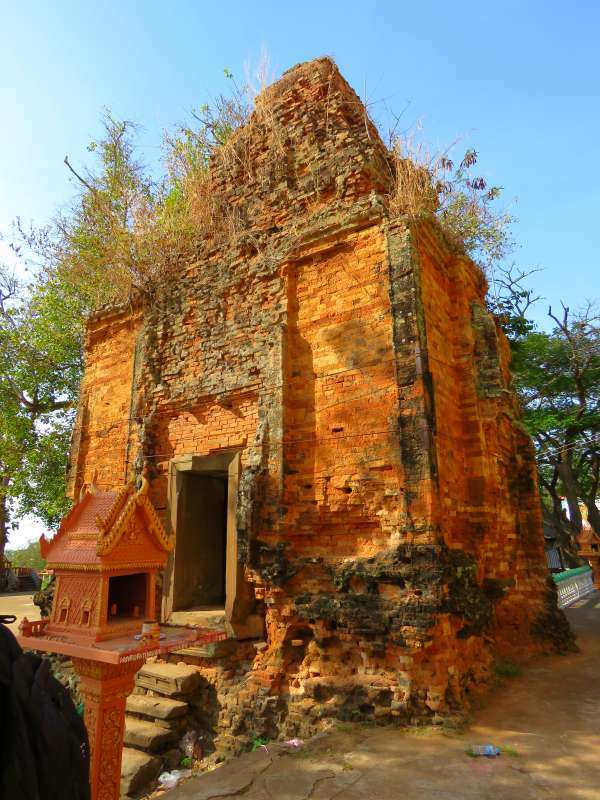 One building is a red-brick, mausoleum like structure dating back to the 8th Century - built before the magnificent temples at Angkor. Grass sprouts from the roof as if the dome is growing an old man's hair and there are carvings on the door frame in ancient Sanskrit. This was one of the few temple buildings we saw that was neither ancient nor freshly painted. I think it is a stupa. 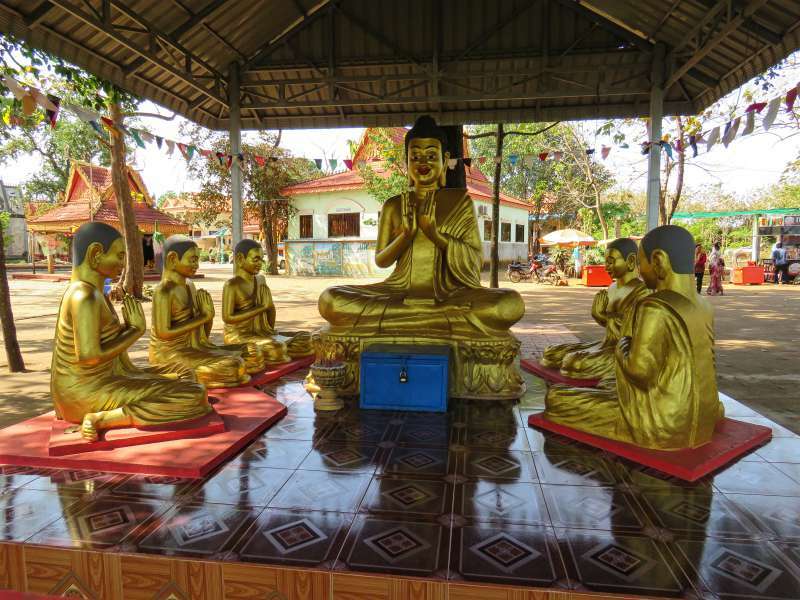 Wat Hanchey is 20 km north of Kampong Cham in Cambodia. 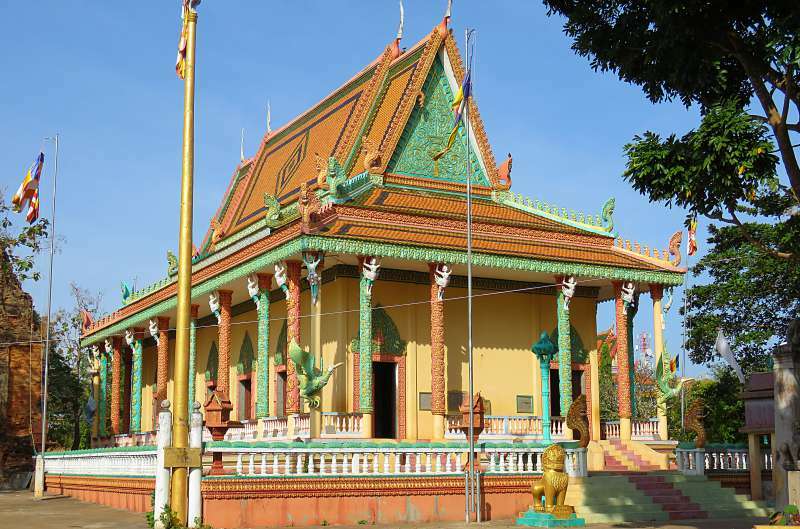 It was the first stop on our Mekong River Cruise from Siem Reap to Ho Chi Minh City aboard Scenic Spirit. The word 'wat' in Cambodian means 'temple' so for example, Angkor Wat is properly translated as 'Angkor Temple' and 'Wat Hanchey Temple' is a tautology, a bit like saying Canterbury Cathedral Cathedral. However as to the difference between a 'wat or temple' and a 'pagoda', I have no idea! For once Google has let me down. Search for the difference between a temple and a pagoda and no two answers agree. Wikipedia says a pagoda is a tiered tower with multiple eaves while a temple is a building used for religious or spiritual activities. On that definition Wat Hanchey is a temple. 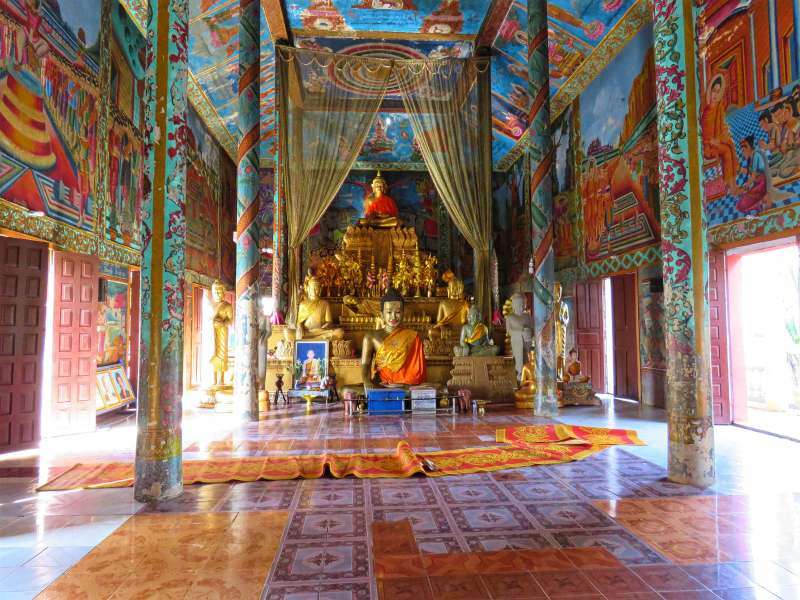 Other sites suggest temples and pagodas have no distinctive appearance - a temple is a place to worship real people, such as a king, queen or national hero while a pagoda is a place where monks live and Buddhists go to pray. On that definition Wat Hanchey is a pagoda. Our Cambodian guide was very clear - A temple is an ancient structure like Angkor Wat and a pagoda is a modern structure still in use. Using this definition Wat Hanchey is a pagoda. Have you ever been to Cambodia? Do you know the difference between a temple and a pagoda? I would love to hear from you if you do. In the West we would call this roof ornament a gargoyle. I don't know what it is called in Cambodia. Can you see what looks like a light globe in its mouth? Buddha and disciples - I think. Apparently you can tell if a statute is Buddha because all the fingers and toes will be the same length. Note: David and I travelled to Wat Hanchey aboard the Scenic Spirit. We received a 10% media discount on the cost of our cruise. You can find more information on Scenic Cruises at Scenic.com.au. I live in Australia but I imagine our education system is very similar to the system in the U.S. Nearly everyone stays at school until they are 18 years old and many go on to university after that. Don't miss Siem Reap. The Angkor temples are incredible. We tacked a few days onto our trip at the beginning of the cruise so we could take in Angkor Wat and the other temples. Great post Lyn. What a shame you were unable to take on the challenge of the climb up to Wat Hanchey, but great that Scenic arranged an alternative. I love the colours used in the temples. We visited Wat Krom and it was identical inside. 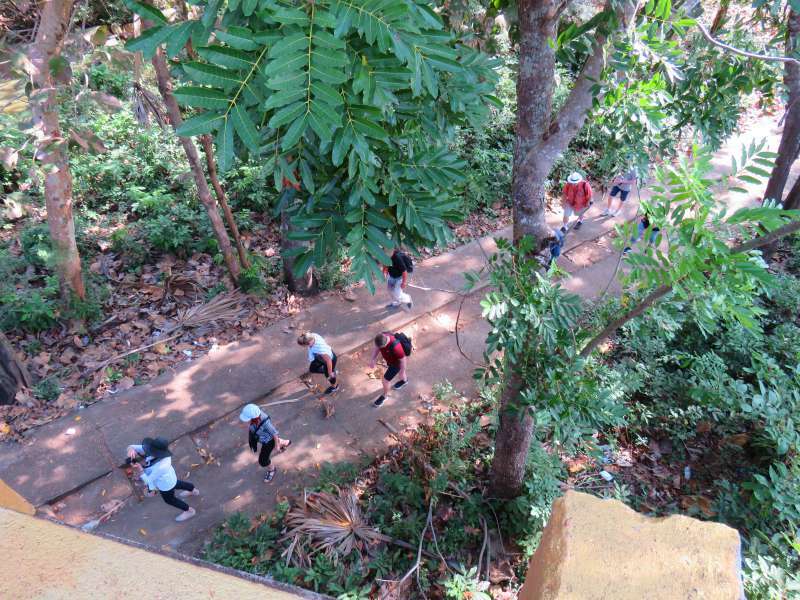 I had to skip quite a few of the climbs at the Angkor temples as well. It just wasn't worth the risk that my heart would misbehave but we still had a stunning time. Beautifully written, Lyn. It’s so great to hear a first-person insight about lives as a young monk. Education is so needed there, to break socio-boundaries. The brick stupa reminded me of Bagan. Thanks for sharing, and I hope your health has improved. I'll have to google 'Bagan' now - lol! My health has improved immeasurably. Except for having to take far too many drugs I am pretty much back to normal. 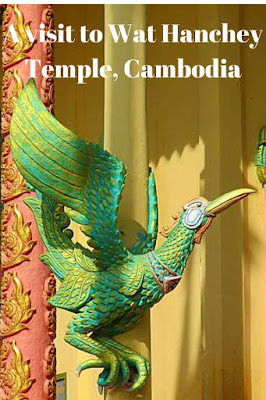 I have not been to Cambodia but it is on my list (especially Siem Reap). I did not know the difference between a pagoda and a temple. Thanks for sorting it out. I'm sorry to hear about the medical problem and I hope it resolves itself. I am feeling much better, thank you. 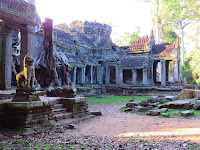 Siem Reap has always been high on my to-visit list so it worked really well that that is where we joined Scenic. I loved my time in Cambodia Lyn. I have immense respect for any person who spends time in a wat. Young or old, for weeks, or years, or for their lifetime, shunning a worldly life takes serious discipline. I recall speaking to 2 months in Phnom Penh who spoke fluent English. Each emitted a peace, calm and love I had not felt from a human being to that point. Amazing how facing fears and detaching largely from this world heals us of worldly troubles and much stress that most humans carry around through their lives. You were clearly touched by your encounter. I had nothing but admiration for the novice who talked to us. So many temples, so little time. I enjoyed visiting Wat Hanchey in Cambodia with you. I've never visited that country but do hope to see it one day. I can recommend cruising as a great way to see Cambodia. Cambodia is a very poor country. I suppose that is what happens when you wipe out everyone who had any education. The photographer in you would be blown away by the temples at Angkor. Thx for this great post on Cambodia. I've never read much about it before, but it looks like an intriguing destination. Wait until you see next weeks post on Angkor Wat and the other temples of Angkor. Looks like a fascinating stop on your Scenic River Cruise. Love the photo of that little guy showing you how he folds his robe, especially! Folding the robe was a very complicated process. I wondered whether he ever had time for anything else. 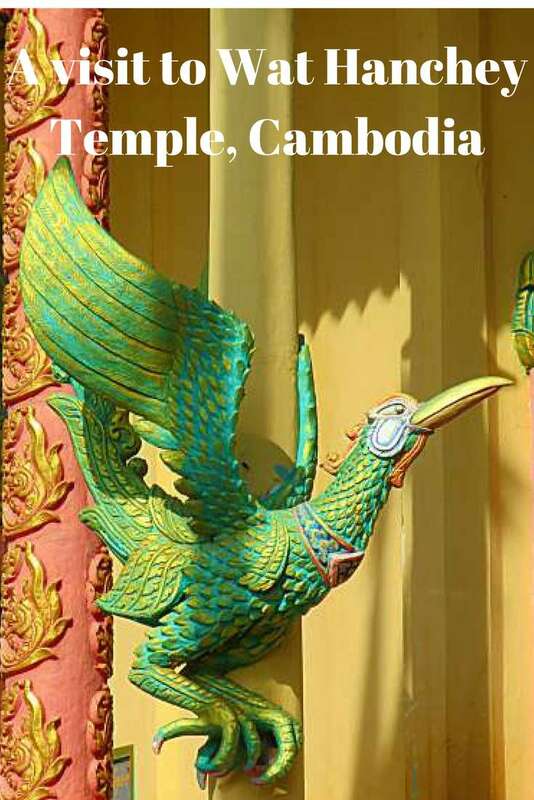 Looks like a fascinating visit to Cambodia. I think a river cruise would provide a great overview and introduction. Thanks. It was a great way to travel. I loved it. I was very suitably impressed, until I read your comment that we should wait and see next week's post on the temples at Angkor. Now I'm eagerly anticipating! :) Not that Wat Hanchey isn't grand itself. Beautiful pictures of the buildings and monks. Thanks for sharing them and your experience with us at #TheWeeklyPostcard and #WeekendWanderlust! As it turns out, 'next week's post' is going to be a week or so late - but I am sure you will be impressed by Angkor Wat and the temples surrounding it when I finally get it published. 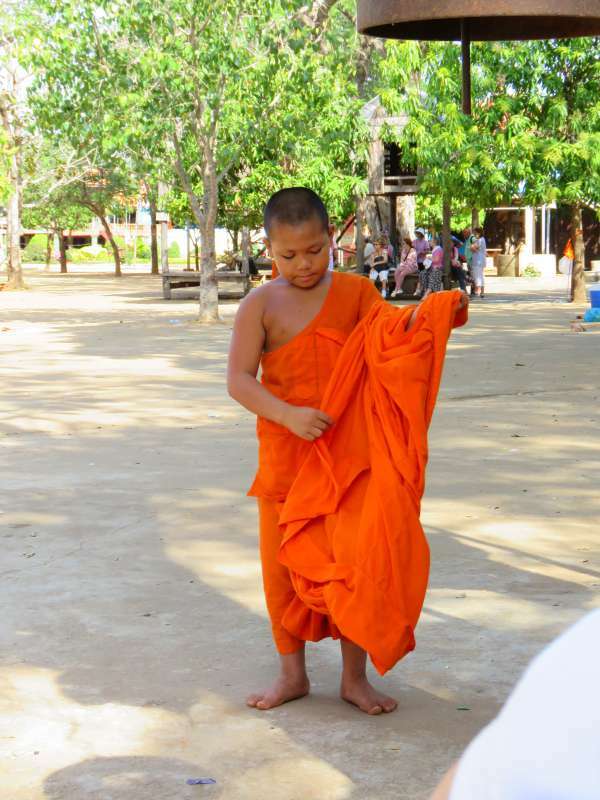 So interesting about the novice monk being there for the education. While cycling in Cambodia we would meet smiling Cambodian kids dressed in crips school uniforms on their own bicycles heading for school. This was in sharp contrast to other similar age children sitting by the side of the road looking forlorn. We learned during our time in Cambodia that education, especially after primary school, is not for all. Sadly, education is not something Cambodian children can take for granted.